PAM: Welcome to another Q&A episode. 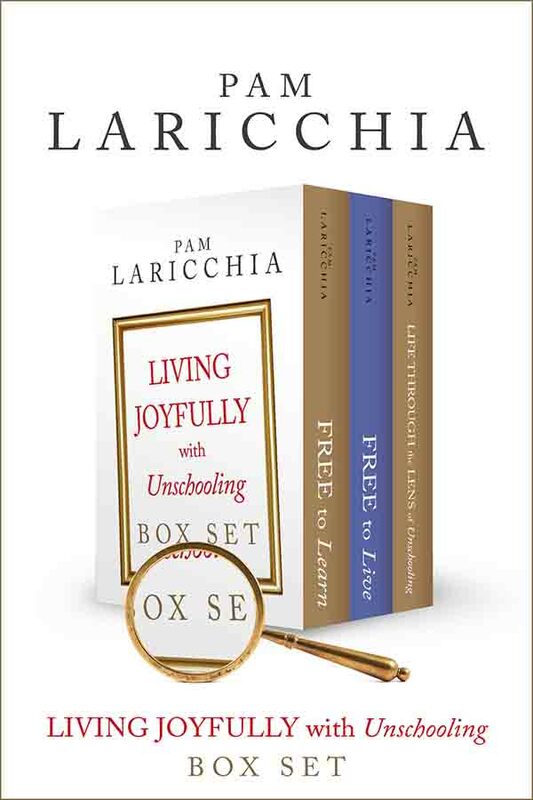 I’m Pam Laricchia from livingjoyfully.ca and I’m happy to be joined again by Anne Ohman and Anna Brown. Hi to you both! PAM: Hi! Thank you so much for joining me. I have so much fun chatting about all these questions with you. It’s fun to dig in! So, let’s get started. You want to go first, Anna? Hi, I have an almost 3 year old son and we’ve been trying to make changes that lead toward radical unschooling. So we have tried to say yes more and let go of the controls we had especially over technology. My son spends a lot of time on his tablet. I used to find it alarming but I see that he is learning and happy. However I have also read that we need to keep offering interesting experiences and activities (not constantly though) so that there are other things that are “sparkly”. How do I do this? He often refuses to go out/do anything else even when I take out other toys or activities when engaged with his iPad and sometimes feels bad that he missed an outing. I don’t want to force him at all. What can I do? P.S. I have a 6 month old too so I feel like we stay home a lot more than we would have if it was just him and I am not able to do very long or elaborate outings on weekdays. It’s mostly just the park. ANNA: First, I feel like what I am hearing is that there are “supposed to’s” and “have to’s” in the question. So I think it might be helpful to let go of that and really go back to just watching your child and connecting with your child. Part of his interest may be that it fits into your life well right now with the new baby. And that’s okay. The new baby is a part of your life. It’s a time of change and adjustment. What I feel most is that I would just be gentle with yourself and everyone as you all figure out this new normal for your family. Continue to look for ways to connect and be together and trust that connection. Just know that when you’re coming at it with that love and desire for connection that things will just flow and opportunities will open up. Again, just be gentle with yourself and let go of thinking that unschooling has to look like this or I’m supposed to be doing that, because I feel like that might be causing this stumbling right now. ANNE: Yes, I agree. It seems like we’ve had a lot of questions like this lately. I think we can start looking at it like when we see the child doing something that we think, “Oh, he’s doing that so much! I should put out other things that distract him away from it.” The child’s always going to feel that you’re trying to distract him away from what he’s doing. The minute that we think that we need to move our child away from something that’s the red flag that comes up that we need to really listen to and go deeper. The minute we see that, the red flag comes up, and we can utilize that and start from there and build an even stronger relationship with our child. Build the trust that is needed with our child. Because, like I said, they can feel the difference. So, what you can do, is go deeper. Instead of saying, “Oh, I need to do something to get him away.” No, go deeper into what your child is doing and really see your child. It’s a wonderful opportunity to truly know him even more and to see what he’s doing. Ask him if you can watch him play because you enjoy what he’s doing. If you have a tablet, you could play games that require two people that he might be interested in. Even on his own tablet, ask if you can try to play the game. My kids used to love when they were the ones showing me how to play a game. And actually, from that very first time they did so, they were always the ones to show me how to play a game! They still are the ones showing me! So, those are fun ways for you to connect and build the foundation. Because when the red flag comes up where you need to get him away from doing something, you can know that that’s pushing your child away from you. Your other option to go to with diving in deeper with him and with what he loves to do is making your relationship stronger. Because your child feels like he’s truly being seen and heard and valued and that you’re not trying to take him away from what he loves. Because the bottom line is, to celebrate all of who the child is, we need to fully celebrate what they’re doing, because that’s a part of who our child is: what they love to do. PAM: I’m going to touch on a couple of things you guys mentioned and dig a bit deeper. I really like that idea, the red flag that Anne mentioned. Because when we’re feeling at odds with something, it does help to dig deeper. That’s how we figure out what’s going on for us, the roots of that. From what you’ve written it sounds like you’re not so much concerned about your son’s technology use but that you’re feeling like you’re failing at some unschooling expectation, like Anna was talking about. So definitely it’s really useful to dig into that. Because you want to understand why you’re feeling that “have to,” why that’s gnawing at you now. The idea of offering other activities to your child comes from wanting to check in and see that they aren’t choosing an activity just because they’re bored and can’t think of something else to do, so they keep going back to it. So if you’ve heard suggestions like that, that’s where that’s coming from. But, the thing is, that there’s no wrong answer to that suggestion. If they choose to stay with their activity, that is perfectly fine too. It usually means they’re engaged and happy with it. Like you said, he is learning and happy when he’s on his iPad. Or it may mean that they’re choosing what they’re doing for other reasons, like comfort or relaxation, and that’s fine too. But the information you’re getting out of it is knowing that they know that there’s other things around to choose from, and we know that they are making this choice. And yes, sometimes that choice that they make may mean that they don’t do other things and they might look back later on and wish they’d made a different choice. But that’s ok too, because they’re learning from that experience. Sometimes, when we’re moving to unschooling, we can get caught up in the idea of not forcing our children to do things and begin to worry that anything we say is going to be forcing them in some way, so we find ourselves scared to say anything. There is so much room to play between not forcing a child and not doing anything. There’s room for conversations, for connection, for encouragement, to find out what they’re thinking, to share what you’re thinking, to come up with other plans, to make contingency plans about plans. And if I read it wrong, and the question really was about the technology, I just think it would help to think not in terms of the technology, whether he’s on or off his tablet, but again, in terms of connection. I think so much of the angst over technology is, at the root, angst over our connection with our child. If we want to engage and connect with our children, instead of trying to convince them to stop what they’re doing and come and join us, it’s so much more helpful if we choose to join them. Anne had tons of ideas about that. So yes, you can offer other activities, but first, get your connection strong. First realize the motivation with which you are offering these other activities. And then you can start to bring that connection into all sorts of places. But you won’t feel as much angst about it, because now you’ll know: this is his choice, this is what he’s doing, this is his joy, and I’m connecting with him there. That’s the part that’s important. And then you can take that connection to any of your activities. 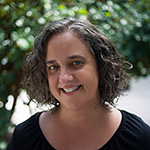 ANNE: I wanted to add especially, you said you were fairly new to unschooling, you’ve been trying to make changes that lead toward radical unschooling. So if in the past, you have limited his use, then he’s still holding tightly on to that. And that’s why your foundation and your life’s energy need to go into building up the trust that you have together. And what Pam was just saying there, to make that the focus. And then, you’ll be able to have more balanced conversations with each other where it doesn’t seem like you have all the power with your words as they used to have, if you’re new to radical unschooling. Hello, thank you again for taking time answering our questions. 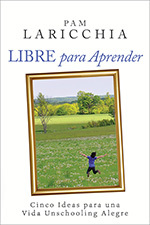 It is really interesting and useful for parents. My question is: I usually hear about honesty in the unschooling life philosophy and what about telling children about Santa and the tooth fairy? Should parents be honest with their children or should they lie about all those invented fairy tale characters who bring their children presents and money? ANNE: Alexandra, I really love your question and I’ve always loved this conversation. We have discussed this topic very often on the Shine with Unschooling list and it’s in the archives. I’ve always loved hearing other peoples’ thoughts and feelings on the topic. Mostly because there’s no one right answer and it depends on the family and mostly on the child. So my family story on this topic is this. As much as my husband and I examined everything that we had once thought to be true and necessary about life and parenting our child, and as much as we discarded most of mainstream society’s beliefs and definitions and expectations of children, because it seemed torturous to our child and not honouring of who he is, this is one area in which it didn’t even occur to us that we should examine. But that’s because the Santa thing didn’t seem like it was something to examine because we saw society giving joy to children. And that was unusual and felt like something we could get behind! That was the basis of our lives! So, we kind of just continued with what we knew of the story that Santa brings present on Christmas Eve. The thing is, though, that our Jacob, our first born, has always been so deep and sensitive and takes everything to heart, and we did not account for that. Jacob always felt as though he had a very special relationship with Santa Claus. He always talked about, “The Real Santa.” He felt like The Real Santa was his best friend. He knew the Santas he encountered in stores and parades and whatever, that they were not the real one, because after talking to them a couple of times, they would ask him his name. And Jacob would be outraged, knowing that The Real Santa, his best friend, would know his name. And The Real Santa knows what he loves, and what makes him light up, and what he could bring him for Christmas. So, these were our conversations about Santa, with him having this real relationship with this person. One Christmas, Jacob got out of our family bed and ran to the living room and he came back crying. I asked him what was wrong and he said that there were a lot of presents in the living room but he didn’t want any, he just wanted to see, and talk to, and hug, his best friend Santa Claus. And honestly, I knew right in that moment, how I could have done this all differently. The presents were not important to him, his relationship with Santa was what was important to him. And he was thoroughly devastated years later when he came right out and asked if Santa brings the presents. In that moment, I realized how I had been burying how bad I felt about lying to him underneath the facade of the joy of Christmas morning. It felt really awful because our entire lives and our entire family was built around this foundation of truth and trust and it was clear in that moment that Jacob did not feel that this was an acceptable lie and I felt the same way. So since then, we’ve had numerous conversations about this. About what we could have done differently, about what my boys would like to do with their own families. And I have apologized profusely for not knowing any better at the time. We all now feel that we would want to have the spirit of Santa Claus be a part of our Christmas. Talking about him, celebrating him, and yes, even believing in him as he represents love, and goodness, and giving, and magic. And that’s the relationship aspect of Santa Claus that the child can still have and can connect with. That’s what was important to Jacob. And we all feel, in my family, that we would just not have the presents be a part of our Santa Story. So that’s our story. And here’s the other thing. Our unschooling lives are pretty close to being magical every day. We really create our own magic by following what our children love and what feels good to them, and add our enthusiasm, our own joy, and excitement, and appreciation for this amazing life we’re living. Christmas with my now adult young men honestly feels more magical than every because we’re not perpetuating the lie. We create our own magic as well as holding on to our magical childhood wonder during that time. So, as I said earlier, and as is true of all unschooling, there’s no one absolutely right formula, because the best thing we do as radical unschoolers, as I said, is to know our children and create a life and a world that allows them to shine and feel good about themselves and to be happy. So to take that into consideration is critical. I know not every child is like my Jacob or Sam and many children do just flow with the new knowledge that it was the parents bringing the gifts not Santa. Like I said, I am so fascinated by all of the stories and all the families’ traditions and ways they do it. Mostly I simply love the fact that so much thoughtfulness is a factor in how each family chooses to proceed with the topic and with their own family traditions. PAM: That was basically my same approach to it. I don’t think there is a right or wrong answer, as Anne mentioned. It really depends on the people involved, especially on the child. Feeling out within your conversations with them what direction might work best for them. If you choose not to go with the Santa or the Tooth Fairy story, not to do it in a ”sit down, I’m going to destroy your fantasy” kind of talk, but just to be more open about the process. It comes up in conversations. I’ll share our story because we were, as Anne said, one where it wasn’t that big a deal. We did do Santa and the Tooth Fairy and it was fun to create (well, mostly Santa), the atmosphere of excitement and fun. There’s one thing unschooling families aren’t going to do, they aren’t going to use the idea of Santa to manipulate our child’s behaviour or anything like that, right? So it is just about the joy and the fun and the excitement. As my kids figured it out, or just started asking questions, I didn’t try to deny it or outright lie about it or prolong it. One thing I did though, was sometimes I recall asking them if they really wanted to know. So they knew it was a question and did they enjoy kind of not knowing yet? Sometimes they did want to wait, I think Lissy waited a while before she really wanted to know the answer. The older kids, as they figured it out, had lots of fun creating the atmosphere and keeping that magic alive for the younger ones too. So none of it felt manipulative at all. But again, that was my kids, and it really depends on the children that are involved. And yes, Christmas is just as exciting now, even with my adult children, because it is the joy and the fun and the traditions that we have liked. That was one piece that I remember from unschooling and Christmas even when they were younger. Because we are helping them meet their needs all year, they’re not in anticipation of needing to get X, Y, and Z at Christmas. So it became more about the gifting as in: these are gifts of things I think you will enjoy. Not that you have to wait for Christmas for this thing I know you really want. They know they can have it in November if that’s when the interest peaks and they want this particular thing. So that kind of took the pressure off of Christmas in that we could really just make it magical, be together, and enjoy the gift-giving part. ANNA: So for us, we chose not to tell the stories of Santa and the Tooth Fairy from the beginning. So for teeth, what we did, was each girl had a charm bracelet, and every time they’d lose a tooth we would go and they would pick a charm and create a charm bracelet. So that was fun. For Santa, they would hear about Santa obviously in books and movies and around, but it wasn’t something that we perpetuated at home. As they got a little bit older (but still very young) and wanted to talk more about it, I talked about how, for me, because in my family I’m the gift giver, not just for my immediate family, but for my sister, brothers, and their families, that’s something that I love! I love this time of year and I love finding that surprise gift that somebody will enjoy because I listen to people and I enjoy that piece of it. I shared that joy with my kids, like how I loved playing that role of Santa and that we all kind of can play that role and then they would enjoy playing the role of Santa with me to find things for their Aunt, etc. So that’s how we talked about it. I have known people, Anne being one of them, who have done it other ways and sometimes that transition worked out great, like Pam said, it was just really natural. And sometimes it didn’t. I think it’s really just about finding what feels best to ourselves and our family, like you both have said. I knew for me, it needed to feel good to me. And I totally hear what you guys are saying because we have to look at our kids and do that, but I feel like I needed to come from an authentic place and it didn’t feel authentic to me. So I had to listen to that, even more so, for me. Because I feel like that probably sets the stage for things. But interestingly, we talk about magic in the world around us all the time, because that feels authentic to me. I see magic everywhere and so they have grown up with me sharing my awe and magic and nature and the world around me. And I’m sure for other people that wouldn’t feel good. So again, I think it’s just an illustration why it’s such an individual choice but find something that really resonates and feels good to you and to your kids and then I think everything kind of flows from there. ANNE: I love how you said, Anna, about how you loved doing the part of Santa and you talk about how they can be Santa, and that’s what Santa is like now. We do enjoy Christmas more for that reason, because we do say, “Oh, I want Santa to bring this to me.” And I don’t feel bad anymore that it’s about the lie. It’s a fun thing and it does bring about a wonderful childhood wonder and that’s what I’m saying about creating our own magic and that’s exactly how you do that. That’s very cool. Hello, My husband and I have decided that unschooling is the path we want to take with our two daughters. They are only 2 years and almost 4 years old. We wondered what a ball park figure of money is needed for yearly expenses. For homeschoolers money goes towards curriculum, whereas unschooling comes museum memberships, trips to discover new things, art supplies, etc. What would be a good base budget for things like that per year of unschooling? PAM: Thanks very much for your question, Ashley. It so happens that last week’s episode was all about unschooling on a budget, so I think you’ll find that helpful to listen to if you haven’t already. And you’re right, there are definitely typical expenses that come with going to school, with homeschooling more traditionally, and with unschooling. But I don’t think we can generally put a number on it. 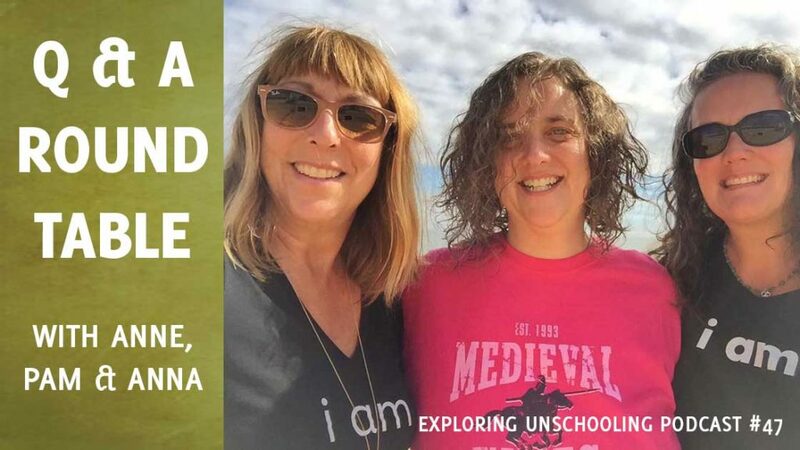 It’s more about what unschooling will look like in your particular family, because families at school, homeschooling, and unschooling all have a wide range of disposable income. So if you’re looking for some kind of number, just for planning ahead, I think it would help to look to your family and estimate some of the things that you guys like to do. Because it’s like budgeting for your lifestyle, it’s like budgeting for life. If your family enjoys going out to museums regularly, you can budget for that. And if you enjoy taking trips to explore new things and places that can be done on a shoestring budget all the way to an extravagant vacation. I think with unschooling it’s more about finding the things that your family wants to do and figuring out ways to do them within your family’s means. So I don’t think there is a minimum budget that you need to have to be able to unschool well. Money is just one other constraint or parameter when you’re thinking about things you’d like to do as a family. ANNA: Yeah, I would say that was definitely how we approached it. 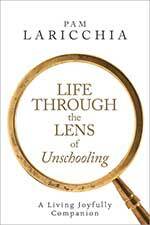 It was never budgeted out specifically as a line item: here’s education, here’s unschooling. We did spend money on memberships and trips and books and fun things along the way. But basically, we as a family would look at our finances and make decisions together about the money that we had available to spend. So we would talk about if we wanted to take a big trip that someone had a passion or interest about or would we rather have more fun money throughout the year as things would come up. Sometimes we would figure a way to do both, sometimes we couldn’t, so these were things we talked about. We are pretty transparent about money in our family and so we talk about the decisions as a family. We would also have this attitude that if it was something we loved and it was feeding our passion, it was something we were interested in, we would find a way. We would just find a way! I love something Pam said too about the Christmas thing, because we very much approached it that way. Christmas was not about waiting for a big item we had wanted through the year. We would get those things as they came up and for me, Christmas was about finding that cool, magical, interesting thing that maybe we didn’t know about. So again, I think it’s just a different approach. But for us, it’s just about talking and doing and there wasn’t really a budget or line item for us. ANNE: Yes, I totally agree. What you talked about, if there was something someone loved to do or everyone wanted to do, that you would find a way to do it, that’s an important energy to hold when you’re thinking about finances and everything with your unschooling lives. Because we don’t want to hand our children an energy of lack, we want to hand them yes possibilities no matter what it is. Then you come to how to do it through conversations and brainstorming and everything. And I have nothing else to add except I think for us it’s really important to pay attention to the energy in which you are making financial decisions. We give such thanks and have such a deep appreciation for those things that we do get to invest our life’s energy (which is money) into, which is our children’s joy, and their interests, and their questions, and their passions. Compared to the energy where you have to spend money on things you don’t want to, if it’s school related thing or whatever, our energy can always be in the yes direction of fulfilling our children’s desires and allowing them to find what they love and fine-tune who they are even more, because of our investment in them. That’s just such a beautiful gift for all of us. PAM: Yeah, I think the danger of thinking of it as a budget is in what you were talking about, Anne, the atmosphere, the environment. As in, if you have so much per month, and this month you’re getting close, you use the budget to say no, rather than looking at the possibilities. I talked with Glenna quite a bit about that in the last episode, so that would be great to listen to too. My husband and I have been deschooling for about 2 months now and we have a 3 year old. This question is about food. He loves chocolate and ice cream but we did restrict these items previously. So once we discovered radical unschooling, we decided to try saying yes more. The problem is that then he prefers to eat mostly sweet foods. A few weeks back it was ice cream. For several days he wanted only ice cream for all his meals. We got a big tub of it and would serve it without reproach. He slowly started eating a few more things but now he’s going through a phase where he only wants chocolate chips. It’s 1pm here and he’s only had 2 bowls of chocolate chips today. I’m trying not to show any disapproval and go with it, while also offering other stuff. I put out monkey platters, take food to him as he plays, bake different sweet treats but he is reluctant to try new stuff and honestly just prefers his store bought treats. I’m worried. Will he ever eat properly again? Or is he only going to crave different types of sweets? It’s also making me angry because we spend so much time making meals, snacks, buying different packaged snacks that we think he may like but most get rejected. I even say, “Ok, have the chocolate but what else will you have?” And the answer is nothing. ANNA: I feel like, probably part of the issue is the transition, and I think Anne talked a little bit about that with your earlier question. You’re early on, and if something has been restricted, there is this natural tendency to hold onto it with a death grip, because they’re afraid it will be taken away, and testing that limit, especially at that age. So I feel like some of that will even out. But I also want to go back to something Pam said in your earlier question, and Anne also, but it’s not about an either/or. It’s not we don’t have any conversations or we do, there’s this in-between ground, which is I think something you’ll be figuring out. For us, around food, we talked about our tastes, what we were wanting: salty, sweet, hot cold, etc., and we’d look for different options that would fit. We also talked about how our body feels when we eat things. I would share how things felt for me and what helped me in the morning to get started, and if I was feeling tired how I’d like protein in the morning or those type of things. I also know that involving kids in food prep can help a lot, because then they’re feeling the ownership and excitement around creating food and serving food and maybe that could take a little bit of the edge off the stress you’re feeling preparing things that aren’t getting eaten. So try cooking together, making snacks together, so maybe that can shift that energy from you’re working, working, working and he’s just the point of rejecting (no, not for me, not for me). So maybe together that’s something you guys can work on, and make it joyful and fun that you do together. I think it is important to look inside and feel what feels good to you. 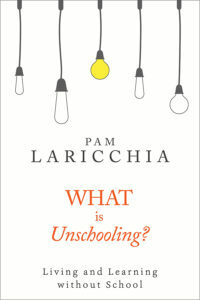 Again, we’re going back to unschooling is not this set of rules or have to’s. There’s not a checklist. You’re a family and together you can work to find foods and habits that feel good to all of you. My hope was that we could all learn, including me and my husband, to learn to listen to our bodies and learn what makes us feel the best, because I found it to be very different for everyone. I can’t know for someone else, but I can help them listen for clues in their body, and support them on their journey as they are discovering that. Three is very little, so I think figuring out a way to work through this that feels good will help you both. So, not using unschooling as a way to disengage, but realize that what we’re talking about when we’re talking about unschooling and letting go of that kind of authoritarian regime, is to have conversations and work together, and to find something that feels good to everyone. Anne, I’ll let you go because you have your book too that might be helpful! ANNE: Right, yes, I will get to that! I just want to go from what you said about how you all learn about food and what feels good to your body because that describes my family perfectly. Because of trusting my children, they’ve had the sacred space to feel out what is right for them and explore paths that we weren’t currently on. Like being a vegetarian and stuff, on their own, without feeling weight of judgement early on about how they should be eating healthier anythings. They’ve got to own how they feel about food for themselves. They’ve had the space to eat food and see how their body feels and reacts to it. This is crucial for them. They’re 22 and 26 now and Jacob is, right now, he’s gluten free, and he’s going through something where he’s having stomach issues, and first thing he knows about is what he’s putting in his body to help him feel better. We all learned all the time, when Jacob was a vegetarian, I was on the computer saying, ok, this is cool. My first thought wasn’t, oh my god, this is going to be hard work, how do I do this, I can’t even think about this. It was, wow, this feels exciting, this is something my child wants, let’s learn how we can do this. And back when my kids were little, there weren’t gluten free options back then, and now Jacob is celebrating the fact that there are so many gluten free options now. That’s because they know their bodies from being trusted. What started me with trusting the kids was a book I read when Jacob was less than two years old. The book has been revised, it’s now called, Kids, Carrots, and Candy. 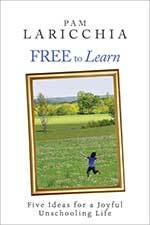 A Practical, Positive Approach to Raising Children Free of Food & Weight Problems. 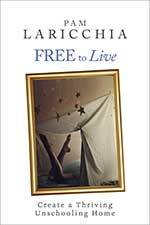 I’ve recommended this book in other podcasts several times and many people find value in this. The most important thing for me is to not place more importance on one food and to not vilify the other foods. That’s what this book also tells you, to offer things as if they are equal and talk about how our bodies feel when we eat stuff. Once again this comes back to, for me, it’s another red flag. When you’re saying this thing is making me angry, for me that’s a flag for us to look at ourselves, surprisingly, you think it’s about the child, no, it’s about us. So, it’s time to look at us and say, what’s making me angry? Why am I feeling this way and how can I see my child better and how can I know my child better? So the answer is usually trust and better connection. Your energy is the most important thing here, trust, information, and non-judgement. PAM: Yeah, I loved all that. Again, I can hear through your questions that you’re deep in deschooling. You’re trying things out, you’re noticing your thoughts and reactions, you’re questioning them, and I think that’s really great. I just want to encourage you to keep going! Remember, as Anna mentioned, that he’s also figuring out this new environment. Things are shifting for him too. I can imagine that he’s really happy that he’s hearing more yeses from you guys. But I also imagine he’s wondering if it’s going to last. It’s likely that, though you mention you’re trying hard not to show any disapproval of his choices, I’m pretty sure he’s feeling the tension. And even that’s ok, it is what it is. But as Anna said, he’s probably going to be holding on more tightly to these new-found freedoms until he feels that things are truly a choice, that he’s not in the middle of a short window of opportunity right now where he gets to fill up on sweets. And this is totally part of the uncertainty swirling around of deschooling as we’re learning, as we’re developing this trust. And we’re learning about unschooling itself. So I think from where you’re finding yourself right now, there’s a couple of things you can do to continue moving forward, so that you’re not feeling stuck. And that’s learning more about unschooling and yourself, as Anne mentioned. When these red flags come up, chances are it’s not really about our child it’s more learning for us to do. So much questioning! And it’s really hard, but it’s totally, totally worth it. And Anna talked about all the conversations that we can have with our children about this kind of issue. And Anne mentioned the book, Kids, Carrots, and Candy… so that will be a great way that you can start diving into learning more about food itself. And on the relationship front, you’ve got the conversations, so that you can, both you and your son, be learning together about how food makes you feel. But also, stop setting yourself up to feel rejected and angry. Stop spending so much time making meals and snacks that you think he’ll enjoy. Because right now from what you’ve written it sounds like you’re making them from a place of expectation, not from a place of exploration. Of just offering these things that he may like. So, when you think about it, when you dig a bit deeper, maybe you will continue to make those things. But do it because you and your husband like them. Full stop. And if your son wants to try them, that’s cool. But don’t expect it. That’s those expectations that get in the way. So, bringing all that stuff together, you’re going to be addressing learning, like through the book, and other research to learn why it’s so helpful to offer up choices to our children when it comes to food and helping them explore how it feels for them rather than judging it. And also through living, through your relationship and connection with him, and to realize this anger and rejection that you’re feeling about food is all about you and to dig deeper into where that is coming from. And I think as you get into all that over time, it will help dissolve that tension that you’re feeling right now, which, I think, is also locking your son into his choices. So, like I said, this is deschooling and it’s beautiful, and keep going! Hi. I am a mom to 3 kids, ages 16, 14 & 12. My oldest daughter chooses to go to school and is a junior in high school. We are in our sixth year of unschooling with my two sons. They both had very traumatic school experiences. Both were asked to leave the public school system due to disruptive behaviour and were placed in a BOCES program, a school for kids with emotional and learning difficulties. When we learned of unschooling, and decided to take that path, my oldest was finishing up third grade and my youngest was finishing his second year of first grade. Being that their school years were so traumatic, I understood they needed a lot of time to heal from all of the scarring school had left them with. We are into our sixth year of our unschooling journey, and we are all much happier and connected. My question is about writing. Both of my boys spend the majority of their time on electronic devices, and are quite fluent with texting and typing. My younger son at 12, has just started reading, not strongly, but it’s coming slowly. He really struggles with writing though. Whenever the opportunity to write comes up, say he needs to write his name on something, he struggles, gets embarrassed and gets upset with himself for being “Stupid”. I’ve tried to explain to him that kids who are in school are forced to write all day long, and that it’s just practice that makes you good at something. I started leaving a notebook on the table with the month and date written out every day, with a pencil next to it, in case he wants to practice writing. And, he often does. It’s not a lot, but I figured it would at least put a pencil in his hand and get him used to it. His handwriting doesn’t seem to be improving at all and he is getting frustrated with himself. I’ve read a lot about reading coming naturally when kids are ready, but I haven’t heard much about writing. In your experience, is writing something that comes naturally as well, or is it something that really takes practice to get comfortable with? I hate to watch him struggle so much and get so down on himself. I’d like to help him any way that I can, but I just don’t know the best way to go about it. Thank you for your time. I really enjoy listening to the podcast. ANNE: Hi Maria! I really love your question and I’m excited to talk about it. First, I want to back up and just address what you said about BOCES. And it may seem off topic but it has a lot to do with the energy in which we are unschooling, in which we are talking about our children, and language that we use to describe our children and everything. So, that it is a school for kids with emotional and learning disabilities, and I live in New York State and I have never seen BOCES as that ever, even as a child in school. Back then, I knew a lot of kids that went to BOCES and I also knew they were the kids who the school viewed as not doing well in math and sciences. But from my perspective, they weren’t sent there because they had learning disabilities, they went there because the school was miraculously accommodating to those whose brains weren’t wired for math and sciences. To me, honestly, these were the coolest kids, who got to leave all of the nothingness that school felt like to me—memorizing facts and spewing them back to the teachers just in case we needed them someday. They got to go to a place and do real world things. My friends wouldn’t just study cosmetology, wood working, and auto mechanics. They would actually be doing those things. I felt like I was the one who was missing out on knowing what was out in the real world because I happened to get good grades in math and sciences, but I knew nothing of the real world. So my point of talking about this is it’s very important how we see our children. They know when we’re seeing them and still describing them through a lens that is less than. And it’s not fair to them, they feel that. I think it’s a wonderful thing that BOCES is available for school kids whose brains don’t work well with school system or whose spirits need to be free. And I’m so sorry that your children have felt that they were less than, that they had such a difficult time. 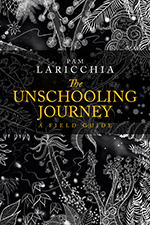 I am so glad you’re unschooling and that you’re healing and you said that you’re so much happier and connected now, that is so wonderful. I think also it’s important for you to check for their healing, for your own healing, any concept from your own mind that they were in school and getting in trouble for misbehaving and everything. The fact that they were seen as difficult students, to me, is a wonderful thing! They were not accepting the status quo. I know it was hard on them with all school has us to believe, but this is the point and part of our healing from those experiences, that’s what I’m still talking to myself about and everything to let all of that go and redefine our children and redefine their childhood according to our view from this lens from our unschooling world. They knew they weren’t supposed to be in that building and look where all this brought you, to this fabulous unschooling world and now you’re focusing on their joy and their strengths and seeing their shine. And the whole thing is a mindset. With your healing it’s good for you all to know to reject the school’s definitions of your children and start with a clean slate and focus on their fabulousness and their shine. Enough about that, so moving forward about your handwriting question. I hear what you are saying! My entire family, we’ve always joked about how we can recognize an unschooler because of their handwriting. Unless of course the unschooler has been interested in learning about handwriting or calligraphy. But the fact is that, as you said, they aren’t forced to write every day and forced to practice writing. As is true of all real learning, an unschooler doesn’t see any point or motivation in learning something just in case they need it someday. And that makes perfect sense. It has to have real value in their real world for them to learn something. 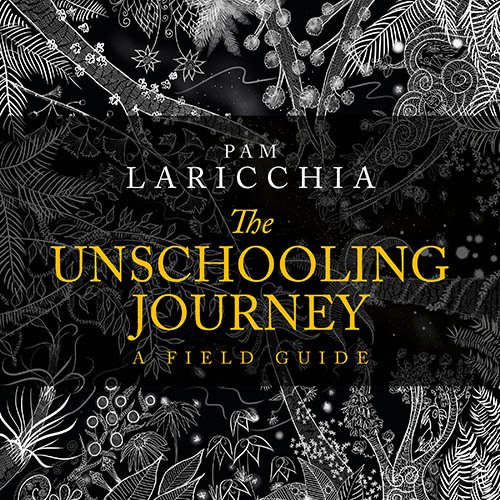 I have an excerpt from one of my conference talks on my Shine with Unschooling website, shinewithunschooling.com, and it’s about how I was Jacob’s scribe for many years. It’s not too long but there are stories in there that I think will be helpful for you to read and I know Pam is so on it, that she will have the link to it. In addition to those stories from there, here’s one. When Jacob was maybe nine or ten he started making a comic strip based on Sam’s guinea pig named Nugget. Do you guys remember that? ANNE: These were really adorable and hilarious and I want to go in the attic right now and find them again. Jacob would be working on these most every day. And sometimes he would bring one to me and show me and I wouldn’t be able to read what Nugget was saying because of Jacob’s handwriting. And so I would ask him what it says. And he would tell me and we’d laugh and talk about the comic strip. And then he would go back and erase those words that I couldn’t read and he would take more time and care writing out the words again. His brain works a bit on the dyslexic side, so sometimes he would ask me about which way a letter goes and I’d help him out. He was already working at fitting all of the dialog into the little speech bubbles in the comic strip as it was, so writing more legibly was simply an extension of his work at creating this thing that he loved creating. And it was also part of it to make sure that other people could read it, otherwise it didn’t hold the value that he wanted it to hold. So, my point with that story is that he had the deepest form of motivation to write more legibly and it was just an open conversation that we had. If he struggled with letters and everything, he would ask for help because he wanted people to read what he had written. Also, there were times when his writing was backwards and things were spelled wrong. I always said to my kids, if they were successful in getting a message to me, via the written word, then that’s all that mattered. I understood what they were writing. Through reading and trust that they would later know how to make those letters better, how to spell words better and everything else. Another story… The first time my kids ever really needed to work on their penmanship was when they needed to come up with a signature to apply for their driver’s permit. We’ve had this discussion on the Shine with Unschooling list also in the archives. Of course, we talked about it ahead of time. They were already going kind of outside their unschooling flow to pick up a book and study how to get a driver’s permit because they wanted to get a driver’s permit, so they were doing this. An extension of that was figuring out how they wanted to sign their name because this was something they needed for something they really wanted to do. So they would write their name over and over, deciding for themselves what looked good and felt good and I would show them what I was taught with cursive, how the letters connect, and they never liked that. They would kind of have their own creative fancy printing of their name for their signature. Again, this came from within themselves. No one told them they had to practice, they wanted to feel good about themselves. They didn’t want to be embarrassed when we took them to the DMV. And we, as unschooling parents, set up our children’s lives so that they can feel good about themselves and succeed at something they want to do. One more story… Just last week, as we were heading to our local polling place for the election, my husband, Sam, and I (Sam’s 22), were talking about what we needed to take with us and my husband asked Sam if he had his photo ID. And I said that’s good to have but remember, they identify everybody by matching our current signature to our past signatures. And Sam went a little blank in his face and he said, “Well, that’s iffy in my case.” And that’s because he never really needs his signature and he does it once in a while. So part of them finding a good signature for themselves is making sure it was reproducible year after year for exactly this reason. So the whole thing is, it’s a different world we live in now. We use our thumbprints to unlock our home screen on our phones and our typing skills on a tiny touch screen has more value than our handwriting skills. So you never even really know when you will need it, but when it has value to your son, that’s where the motivation is going to come from. And I hear you say that you don’t want to see him struggle, so as I was saying, you don’t need to put him in a position of struggling. When something comes up, you can help him feel good about himself and work on it at that time because it has real meaning in his real life. PAM: I’m just going to step back for a second and say, hi Maria! I’m very glad you’re enjoying the podcast, yay! And I love that you’ve been able to bring the boys home as Anne was talking about, and out of what was for them a traumatic atmosphere. So, what I thought I’d talk about is when my kids were feeling down over the years about developing some skill that they were finding challenging, and the point that’s really big that Anne talked about, is when they find value. It’s also having the conversation about where are the messages that you’re getting that you’re not good at this or why do you think you need them, why do you want to do it, helping them process that. So I wanted to come at that conversation from a few angles. So one is, especially with handwriting, over the years with my kids, as conversations came up, I would mention, as you said you did, that school kids need to be proficient at it, and why that is, and how typing is actually a much more applicable skill, moving forward right now, in our culture, how handwriting skills run the gamut in adults now. Like the stereotype of the doctor with notoriously bad handwriting. Having hard to read handwriting is not equated with intelligence. So, when that frustration came up, I made a point to point that out when we were out and about and we saw examples of other peoples’ handwriting. It’s funny, just yesterday, I took Michael to his clinic appointment, and last night I made a comment because I saw her prescription and it was the neatest handwriting that we’d ever seen from a doctor on a prescription. I pointed that out too to Michael and he noticed it too and we had a laugh about it. Another aspect is, if they’re interested, you can make it easy for them to practice, which you have done. But if they continue to feel frustrated about their progress, especially when they’re older, you can start to talk to them about it a bit more. Ask them, find out if they’re interested in putting a little bit more into it. Sometimes when they express frustration to us, that venting is enough for them. We’re someone that they can vent to. They wish they were progressing faster, hence the vent, but they aren’t interested in learning more or putting more effort into it. They’re willing to put up with a slower pace if it’s something that they value so we just continue to listen and validate. But if they’re looking for more, then I offer to research different things for them. So, if they’re trying out one way and they’re still feeling frustrated, it’s not so much about telling them to just make more time to do it maybe. Maybe I can find different ways, different things that can help them make more progress. For example, my eldest had trouble in school with handwriting, to the point where he was doing everything orally with the teachers for the last year or so. And I remember from my research back then, that visual-spatial learners are more apt to have trouble with handwriting. And even within the school environment where we were, it was suggested just keep keyboarding as an alternative and doing things orally. These things are even more acceptable and part of our culture now, with so much audio content, so much keyboarding and computer use, that’s a great alternative. They also found that some kids found calligraphy much easier than your typical handwriting because it was about allowing them to slow down and giving them time to form beautiful letters. I though of that as Anne was talking about how Jacob would go back and just take more time to do it, that it’s more about the art than about the function. Sometimes doing that mind shift helps some. ANNA: Yes, so all of that and I’ll just specifically talk about writing here just some more examples. One of my girls clearly wanted to master writing and she didn’t really even bring that to me. What I would find is sheets of paper where she had just written over, and over, and over again and I mean, countless sheets of paper. I thought it was so interesting. So it was just something she took an interest in. She wanted to have a particular handwriting, she wanted it to look a certain way and she just did that. She developed a handwriting that she’s comfortable with. And she did the exact same thing when it came time to signing her name. You’d see her signing different ways and finding one she could repeat. She did want it to look in kind of a cursive way and so that was, again, not something we talked about specifically. So she just worked on that and I showed her a few things and she just practiced until it made sense to her and that she had a signature that she was comfortable with. My other daughter has some dexterity issues and handwriting never came easy for her. When they were growing up, Raelin my younger one would always be the one that would write things down for the big idea that Afton would have. She didn’t want to practice it because she’s also a person who likes to do things perfectly the first time. So that can make things extra challenging when you have an expectation of it being perfect and it takes time with something like that. For the most part she doesn’t write. When it came time for her to sign her name I looked up the laws and we both explored what needed to, what had to be done, what constituted a signature and we found out that technically you can just put an X. That legally that’s a signature. She is able to print her name in a way that she feels comfortable with so she just uses that on her driver’s license on other things like that. She never uses a cursive signature. And it works just fine for her. In our research and exploration we did find, just like Pam said, that lots of people have terrible handwriting and that it isn’t any kind of indication of aptitude or smart or not smart. So just seeing that was kind of helpful for her to let go of any fear she had around that, and took the pressure off as she found her own way. I find her print to be very readable. I like it, I think it looks great, and she gets across her ideas to me perfectly. For her, she finds it’s slow, so it’s not her preferred method of communicating. She is lightening fast at texting and typing and that’s really what she uses most in her life. For us it really was that, finding what works for both. I did have tools around at the time and we talked about it, whether they wanted to try these different things, do these different things. Sometimes they used them, sometimes they didn’t. Really, for the most part, it became practice for the one and the other just deciding it wasn’t something she was interested in. Maybe it will be when she is older and it may not be. Again, I think we have so much technology now where it isn’t that necessary. So that’s kind of been our story about writing. PAM: Yeah, When it came to signatures too, the boys would print them on forms for the odd times when they have to do it. And they may worry about it a bit and overthink it but when they go, nobody ever blinks because they see handwriting has such variety. Nobody that has to take in a form with a signature, I’ve never seen anyone judge a signature. Like Anne said, it’s just more that it looks the same over time, it doesn’t matter whether it’s an X or what it is. ANNE: Right, and they account for the change too. Even with voting, you’re 18 when you can first vote, so of course your handwriting is going to change throughout that time. I wanted to share a couple more things. Jacob is an artist and we went to the Eric Carle museum one time and we were looking at this display of some of his notes and I called Jacob over. I was like, “Jacob, look! You can’t read Eric Carle’s writing either!” (laughter) We were hugging each other and it was the same thing when we went to look at Tim Burton’s exhibit at the MOMA. It just IS and to this day, at the library, (Jacob works with me at the library and I have another clerk named Cathy) and we will just say if Cathy and I are talking and we see something that Jacob had written down, we’ll ask each other what it says. And she’ll say that next time she’ll write it for him. Nobody makes fun of him for who he is because the whole person is taken into account from when we see a person. Their handwriting is probably the least concern of anybody else when you are encountering a person, it has nothing to do with who they are and their energy. But it does come from who they are and so it is what it is. So that’s why it should be gloriously unique and celebrated, as always. PAM: Yeah, I think when issues like this come up it’s just another part of deschooling for us, realizing, “Hey, we’re judging this.” “Hey, he’s gotten the message that it’s something to be judged.” And to peel back those layers and get past that judgement piece and realize it’s just who a person is, who they are in the world. Ok, that is the last question for this month, I want to thank you both so much for answering questions with me because it’s always lots of fun. Just a reminder there are links in the show notes for everything that we mentioned in the episode and as always, if you’d like to submit a question for the show just go to livingjoyfully.ca/podcast and click on the link. Have a great day, everyone, and bye! ANNE and ANNA: Bye bye!